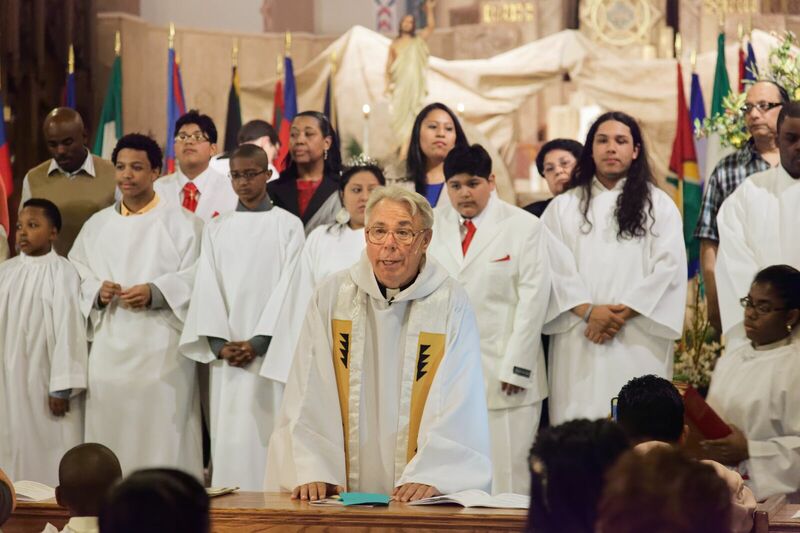 Father Michael Perry retired on Jan. 31 and is now pastor-emeritus at Our Lady of Refuge, Flatbush. Born in Astoria to Ukrainian immigrants, he attended St. Anastasia in Douglaston and St. Mary H.S., Manhasset. At Marist College, he majored in French. He was ordained in 1971 after graduating from Christ the King Seminary. The young priest was immediately sent to Puerto Rico to learn Spanish. He served as parochial vicar at St. Gregory the Great, Crown Heights, and at Queen of All Saints, Clinton Hill. He then served as the Catholic Chaplain of the Pratt Institute for 23 years. Named pastor of Our Lady of Refuge in 1993, he worked closely with the Sisters of Mercy, the NYPD and FDNY. He also helped build strong lay leadership at the parish that will secure a place of refuge for all children of Mary for generations to come. Save the date for a free book signing and lecture event featuring Father Thomas Berg, faculty member at St. Joseph’s Seminary, Dunwoodie, and author of “Hurting in the Church: A Way Forward for Wounded Catholics,” at the Immaculate Conception Seminary in Huntington, Feb. 25. Father Berg’s book will be at the center of a talk focused on the painful reality that many Catholics have been hurt, especially by those in the Church. Father Berg offers his book as a roadmap toward healing and renewed faith. No registration required. For more details, call 631-423-0483 ext. 141. The third annual Day of Recollection for Parish Musicians will take place Saturday, March 3, 10 a.m. – 3 p.m. at the Maryknoll Seminary, Ossining, N.Y. The presenter will be Father Joel Warden, c.o., pastor of the Oratory Church of St. Boniface in Downtown Brooklyn. 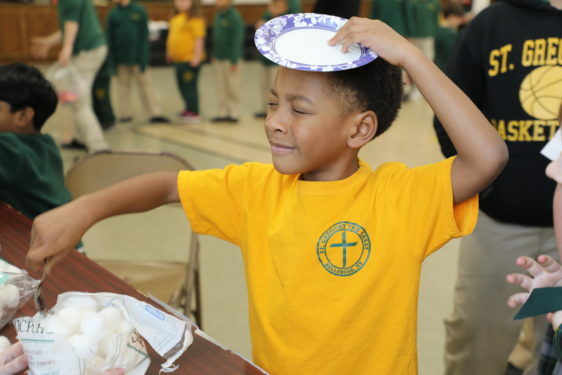 Each year, to highlight the “service” component of Catholic Schools’ Week, the junior high students from St. Gregory the Great Catholic Academy, Bellerose, organize a Penny Carnival. A donation of over $1,300 was raised by students and parents. It will be sent to the Smile Train Foundation for children with cleft palates. The highlight of the afternoon is always the “pie in the face” station that brings in the most money. Teachers volunteer themselves for a whipped cream facial and are really good sports. This week’s Tip of the Tablet TALK Top Hat goes to Michelle Mueller and her seventh-grade students for all the behind the scenes work that made this Catholic Schools Week activity a HUGE success! Through the years the school has donated more than $10,000 to various charities thanks to the Penny Carnival. 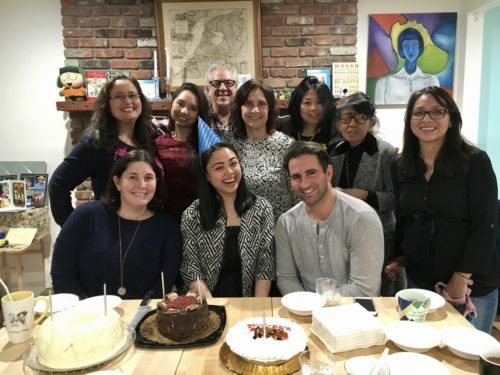 November for Hurricane Harvey relief reunited over dinner and birthday cakes in January as part of their growing bond. They reminisced about special moments together during their week-long service trip under the direction of Msgr. Kieran Harrington, vicar for communications. Some recalled their first day in Texas, that even as strangers, the group celebrated a volunteer’s birthday, Mary Carriero, at a Texas barbecue restaurant. Two month later in New York, the group shared a meal to discuss other other possible service trips and celebrated another birthday, this time, for Tablet reporter Melissa Enaje.